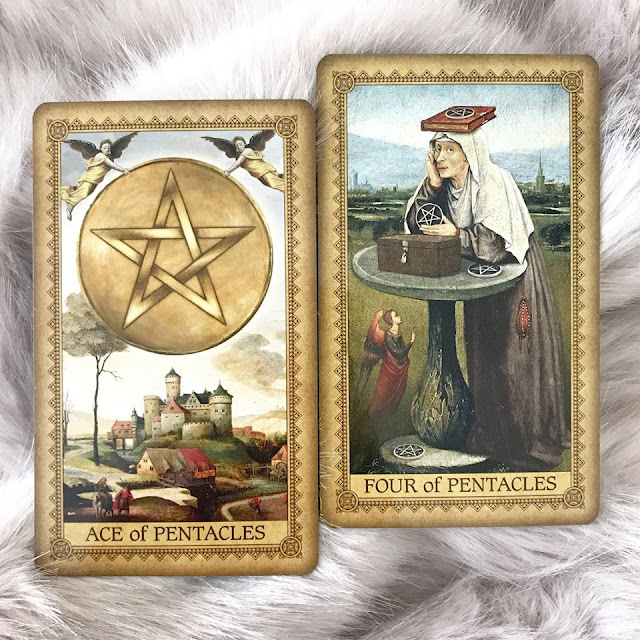 Today's collective reading from 'Influence of the Angels Tarot' suggests it might be time to take a look at your financial situation. Again! This is something that also came up at the end of January, so it may be that a particular issue is still not quite resolved. The Ace is considered to be a positive card. It shows money coming in - possibly from a new and potentially fruitful venture - but today I'm struck by the faces of the angels carrying it and also to the donkey (beast of burden etc) which makes me wonder - "At what cost?" Is this something you need to be asking yourself at this time? Are you putting too much emphasis on your financial situation and forgetting to take care of your health and wellbeing? It looks like the angels might be trying to manoeuvre carefully to avoid dropping the coin on the people below, which would surely flatten them! How is this reflected in your situation? Are you having to decide where to put your money, or what to do with it? Perhaps you're carefully managing it and trying to determine the best way to keep up with your responsibilities without taking on too much or becoming overburdened? The suit of Pentacles relates to the element of earth and the woman's demeanour reflects this. She looks very grounded and steady, as she leans into the table, with her feet on the floor. There is no sense of movement, haste, or panic, only a patient look in her eye. How can you apply her approach to your situation? Finally, there is an angel beneath the table - a reminder that some things are more important than money. You might do well to remember this too!